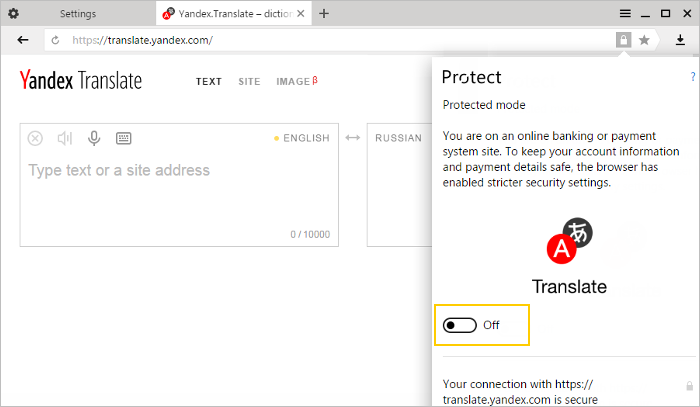 Protected mode is a mode that Yandex Browser enables on pages of banks and payment systems to make electronic payments safer. In protected mode the browser enables strict verification of certificates. If the certificate is verified, the browser disables extensions and changes the interface. Protected mode is part of the Protect integrated security system. Restriction. Protected mode is only available for Windows. There are problems with a certificate; for example, a bank certificate is expired, invalid or untrusted. An unknown certificate installed in the operating system is used by the program or network administrator. A certificate installed by special software is used. Attention. If protected mode has not been enabled, it is unsafe to make electronic payments and we do not recommend doing this. In the protected mode, Yandex Browser disables all extensions other than password managers verified by Yandex. This is to prevent malicious extensions from stealing or tampering with your payment information. The extensions are re-enabled when you exit protected mode. 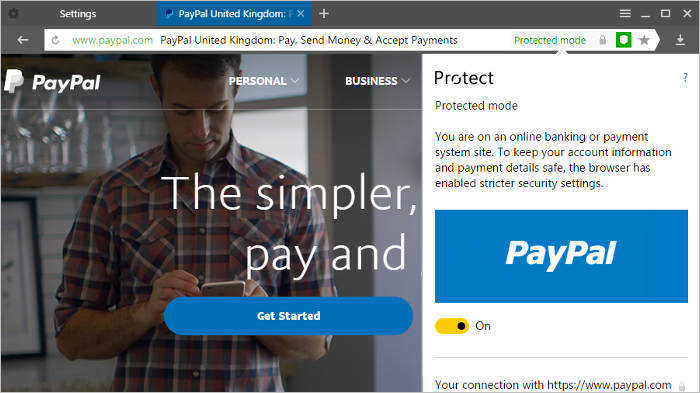 Protected mode is enabled by default when payment pages are open. The browser’s upper panel and tabs also turn dark gray, and the name of the mode and the icon appear in the right half of the SmartBox. 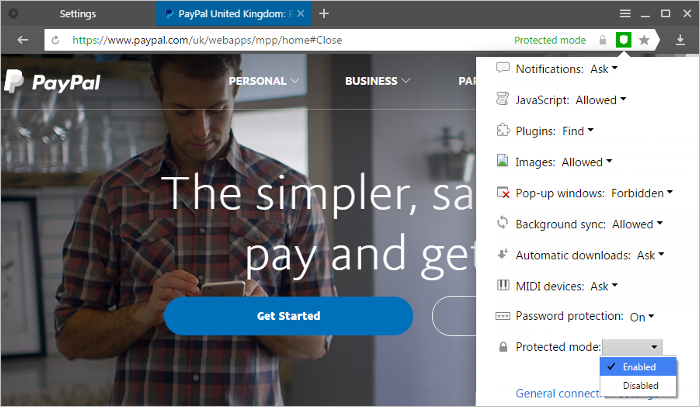 If you have opened an online payment page and don’t see changes in the interface, enable protected mode manually. You can add any page that uses HTTPS to the list for enabling protected mode. In the right part of the SmartBox, click any Protect toolbar icon. In the window that opens, click More info in the section showing the connection status. In the Permissions section, enable the Protected mode option. Attention. If protected mode is not enabled, there are most likely problems with the site certificate. It’s better not to make payments on this page. We recommend that you open the Protect panel, read the information about using the certificate and assess the risk of theft of your payment information. Attention. Disabling protected mode jeopardizes your data. We do not recommend disabling protection. On the right side of the SmartBox, click . In the Protected mode section, change the setting to Off. In the Privacy section, disable the Open online banking and payment system pages in Protected mode option.